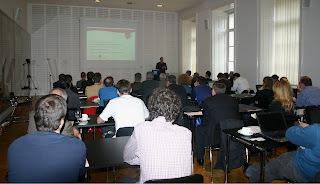 23-Oct-12, TU Vienna, Boecklsaal (Herbert Boeckl - Austrian painter) - Mathematica in Computaional System Engineering. The spirited panel and individual discussions made it quite obvious to me: over 40 delegates from academic institutions and industry found the seminar as exciting as myself. Computational system engineering has so many aspects and we tried to describe it from the foundation of advanced technical problem solving to the benchmarks grown in the historical co-evolution of problems and scientific achievements and to the latest practical solution. Felix Breitenecker, Professor for applied mathematics, mathematical modeling and simulation at the Vienna University of Technology, draw the emergence of requirements on modeling and simulation in a historic context of simulation languages and systems as well as mathematical development and research results. It was amazing, how he developed a criteria list that grew "naturally" along the talk - with full explanation, why. For modeling, simulation and its interplay. Model-transformations to enable better solving, symbolic and numerical computation with regime switching, hybrid computation, .. co-simulation. Jan Brugard, CEO of Wolfram MathCore, presented "his" SystemModeler in the context of the requirements and showcased in real live examples what an advanced stand-alone tool can do for modeling and simulation of dynamic multi-engineering systems and how its link to Mathematica completes a workflow that integrates analysis, design and control optimization. Felix Breitenecker made the encore by showing the modeling and simulation of a "hammer" that was used at the world's first known salt mines - during Hallstatt culture. His team modeled it in SystemModeler.